I'm inviting you all to see this play, a perfect pre-Christmas show for the whole family. 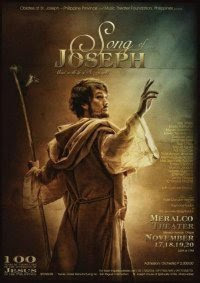 Details taken from the Facebook Event page for "Songs of Joseph"
I didn't see you in the cast bro? Are you a sponsor this time like Jehz? Pa-ispo-sponsor na lang. LOL. Which reminds me, sana magsponsor sya ng badminton tournament for bloggers. he. A lot of neurons involved and I am beefing up my right brain for that.